Poor posture is a very common condition. Posture issues are generally caused by muscular imbalances, in which a muscle is either too tight or too weak Poor posture can manifest into many different conditions; the most common is back pain. According to the American Chiropractic Association, 70 percent to 85 percent of people experience back pain at some point. Performing the right weight exercises can greatly improve posture. The deadlift works most of the muscles in the legs, lower back and core. 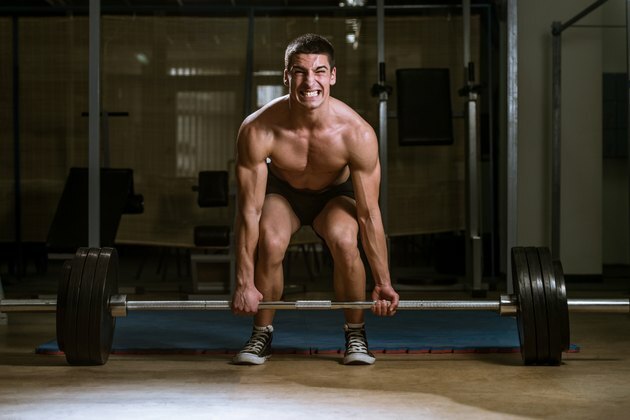 It's most commonly associated with building strength and power, but according to TheDeadlift.com, performing the deadlift correctly strengthens the spine, which can improve posture. To perform a deadlift, put a barbell in front of you and stand with feet shoulder-width apart. Grip the bar with your hands outside of your legs and lower your hips until your back is at a 45-degree angle to the floor. Push your chest out, look straight ahead, keep your abdominals tensed and lift the bar from the floor by straightening your knees and hips. Stand fully upright, then return the bar to the floor in the same manner. Do five sets of five repetitions once per week, focusing on perfect technique. Upper cross syndrome is usually referred to as a hunched back, caused by having very tight chest muscles and weak upper back muscles. To perform a face pull, stand in front of a cable machine with a rope handle attached to the pulley set at head height. Grasp the rope ends with straight arms, then start the exercise by pulling your shoulder blades together and bringing your hands toward your face until they're three inches away. Return slowly to the start position. Perform three sets of 12 repetitions two to three times per week to strengthen your upper back and prevent upper cross syndrome. Having weak core muscles can cause you to slump forward and develop poor posture. The plank is a very effective core exercise to improve and posture. Start in a prone position with just your elbows and balls of your feet on the floor. Keep your back as straight as possible by tensing the abdominal muscles. Hold this for as long as you can with good technique. Perform two sets of maximal holds twice per week. Goblet squats strengthen the leg and core muscles. They also stretch the hip flexors, adductors and lumbar spine, which when tight can cause bad posture. Hold a dumbbell in front of your chest with both hands and your feet firmly planted on the floor, shoulder-width apart. Push your hips back and bend your knees while keeping your back straight. Descend gradually as far as you can with good form, then forcefully push back up to the start position. Perform four sets of 10 reps two to three times per week. Can You Build a Muscular Chest with Pectus Excavatum?